Ouch. 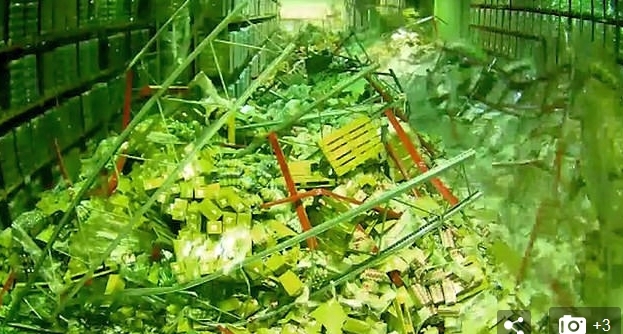 Take a look at the video associated with this Amazon warehouse disaster in which a forklift drive nudges a shelving unit and the whole warehouse shelving system collapses like dominoes. Be sure to watch the full one-minute video, not just the tiny clip. It's not known when or where this occurred, nor the fate of the poor forklift driver. All I can say is, what happened to the notion of reinforcing these high shelves with bracing from the ceiling? They don't brace the shelving to the ceiling or wall because the shelving will pull down the ceiling or wall in case of an collaps off the schelving. And in Europe it is simple forbidden. Ditto what Anon said. Such racking could pull down walls if that happened. Having said that, it looks like there was some very important safety bolts missing. 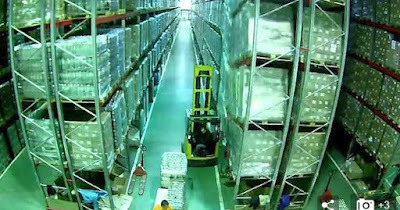 I drive similar forklifts at my job, around similar racking, and have bumped beams more times than I can count, with essentially no damage to anything except maybe a new dent in the beam. If he was wearing his seatbelt he might have survived actually. That over cab structure is designed to keep a fair bit if weight off of the driver in the event of a crash or roll-over. It'll depend on what exactly was in the boxes that hit him and if his seatbelt was fastened (otherwise he likely got thrown when the machine was pushed over and then he was screwed). I'll bet it was a Monday morning. Worker #1: Clean up in Warehouse 7!! Co-worker: Don't you mean "Aisle 7"? I don't fault the driver at all, with the exception that he simply should not have tried to maneuver through such a tight spot, what with all the blockage this one was unavoidable. He was probably also with a tight schedule so "you better hurry" type of thinking. The government will probably blame it on Muslims. This probably won't be seen by many, but my husband studied this video and had this to say "Amazon missed the boat on this one (Navy guy). In the industrial facilities I have worked in they had pillars guarding their industrial racking. This looks like standard racking and is designed for this load in its original form. The corner posts and braces are all metal that is bent in a shape to give it the strength. Once a kink or bend is put in that rolled metal it will fold and that is when the trouble starts".